After months of preparing, Into the Country Tours is on the road. With the team from Gippstech as our first guest group, we set off on our Food and Wine adventure. Our first tasting was with Dash from Brandy Creek, he shared his knowledge of wine and provided some great insights that we all appreciated. After our visit we all continued on a little wiser, and may I say a little merrier (even though Dash recommended to just taste and not drink the wine). Howler Brewery was our lunch stop, it came with a beer and cider tasting. Many of our group were new to craft beers but everyone had a go and got into the spirit of things. So we became beer experts in no time at all. I think the cider was the winner on the day though, because every glass was drained to the last drop. Lunch was a hit and everyone raved about the food, our compliments to the chef! 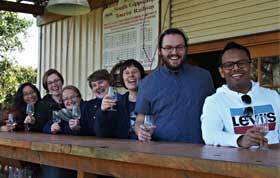 With the sun on our backs we jumped into the bus for a short jaunt to the Gippsland wine company. Mark runs this boutique vineyard, he has a huge depth of experience that he acquired working in the wine industry for years and years. Mark shared his knowledge with us along with a few great yarns about the local area and its characters. After a fantastic time at Gippsland Wine Company we shambled back to the bus and headed for a caffeine hit at Ripplebrook Winery. As we sat under the veranda, around a hand crafted coffee table, we looked across the vines to the snow on the Baw Baw’s and let our coffees warm our souls. What a day! I Loved sharing it all with the Gippstech team and I’m looking forward to sharing our next outing together too, maybe the Gourmet Farm tour? I’m also looking forward to meeting more great teams from Gippsland and further afield to share a marvellous day out as we go Into the Country together.